The Jun kilns were based in Henan Province and had locations throughout its Yu County. As of today, over 100 kiln sites have been discovered. Some of which specially produced porcelain ware for the imperial courts, with a history that dated back to the Tang Dynasty; its most flourishing period was during the Song Dynasty. 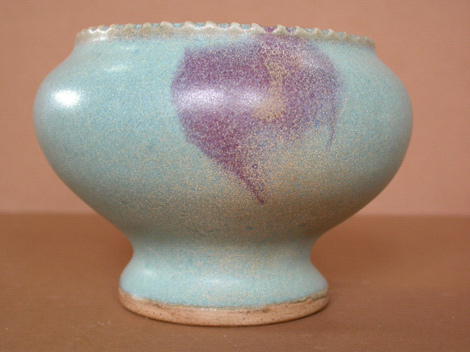 the unique feature of Jun porcelain lied with its special turbid glaze, which contained low concentrates of copper oxide. If we consider iron oxide the coloring agents for celadon and black porcelain, then Jun porcelain gained its wonderful hues from copper oxide. Copper turns green in oxidation fire and red instead in reduction atmosphere. Due to the small traces of copper oxide in Jun porcelain glaze, its color was often green infused with violet, as if the rosy clouds during sunset. 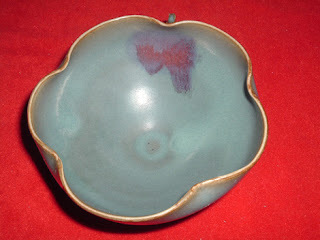 Even the blue contained in Jun porcelain was different from the usual celadon; it was a blue with a milky tone. 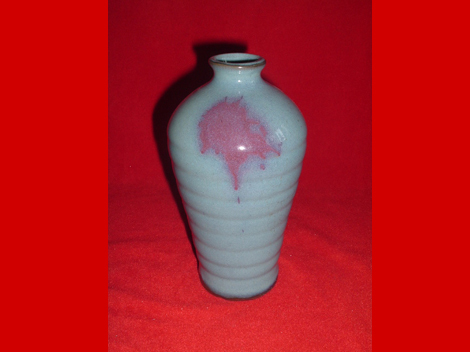 The successful creation of Jun porcelain was a great achievement by the craftsmen of the song Dynasty. its mysterious and unpredictable colors have gained the love of the people during its time, making the Jun kilns one of the most famous around. By using copper oxides as the pigment, the Jun kilns successfully produced copper-red glaze in a reduction fire. This was a breakthrough in the technology of ceramics. Adding copper oxide as coloring agent was a rather difficult task, as the chemical components in the basic glaze, the temperature and atmosphere were all very sensitive factors. Even the smallest bit of deviation from the requirements would have resulted in an undesirable shade of red. 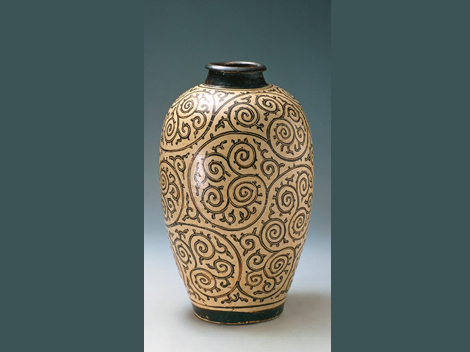 Another distinguishing feature of Jun porcelain glaze would be the pattern referred to as “earthworm crawling in the mud” 蚯蚓走泥纹. It appeared as if the trails left in the soil by earthworms. This was a result of the glaze being particularly thick in Jun ware. When in the process of baking, under low temperature, the glaze began to chap. When the temperature was raised, glaze that had not congealed flowed back into the crackled creases. Just as the crackle glaze, this defect in firing technology turned into a kind of rich and unique decorative language. There is a saying that no two pieces of Jun porcelain are identical, which means that even porcelain born of the same kiln are somewhat different, as most of the coloring is done through a natural process; people have little control over the glaze color. However, this type of natural formation was the highest ideal in aesthetics at the time. Jun porcelain vessels such as flower pots, cauldrons, writing-brush washbasins and more; all modeled after ancient bronze vessels used for rituals. Thus Jun porcelain appeared detail. There were similarities between Jun porcelain and those of the Imperial, Ru and other kilns of the same time period, because they were all intended for serving the courts. Flowers and floral patterns were the fashionable form of decoration for porcelain at this time. However, Jun porcelain used not patterned decorations but the vessels themselves came in the shapes of flowers. Commonly seen were toilet cases, flowerpots, flat bowls and writing-brush washbasins in the shape of Chinese crabapple flowers; flowerpots and pot bases in the shape of lotuses; as well as pot bases made to resemble sunflowers. It was a truly unique feature of the Jun Kilns.